The power of the worldwide web for a minority culture like Wales is clear, starved as it is of a serious broadsheet culture. For although the inherently democratic nature of the internet can lead to a dilution in quality, it is far from being a dumping ground for those who can't find publication elsewhere. Serious writers are very much into blogging, launching themselves on Facebook, and publishing snippets of their latest work on their personal websites. Publishers are similarly taking steps to secure their place in a digital future, and online reviewing communities are burgeoning. The very texture of our literary culture is changing. This issue of New Welsh Review explores some of the most urgent questions surrounding digital, as opposed to print, cultures. Anthony Brockway argues persuasively for the near-revolutionary power of the blog, especially in its potential to mix high and low culture. His lively account of the various sub-genres that now exist in the blogosphere points to the lexical as well as geographical and class limits that have been transgressed by bloggers. In a world where downloads, podcasts and vodcasts exist within a babel of textual abbreviations that developed out of email, instant messaging and the mobile phone, it seems that language remains as ceaselessly inventive as ever. Despite fears that we are becoming increasingly illiterate with every generation that passes, the blog phenomenon shows that the fascination of the human species with the versatile contours of written communication isn't over just yet. Peter Lord, on the other hand, casts an enquiring gaze over the notion of digital posterity, focusing particularly on the life and work of artist Clifford McLucas: McLucas's early fascination with digital media has left archivists and curators with something of a problem, and as such presents an interesting test case when it comes to the transferral and retrieval of 'virtual' information for future generations. Similarly, Gary Owen's article about the genesis of one of his own plays, Father Figures, indicates how the latest technological developments can be embraced in the process of creation itself. 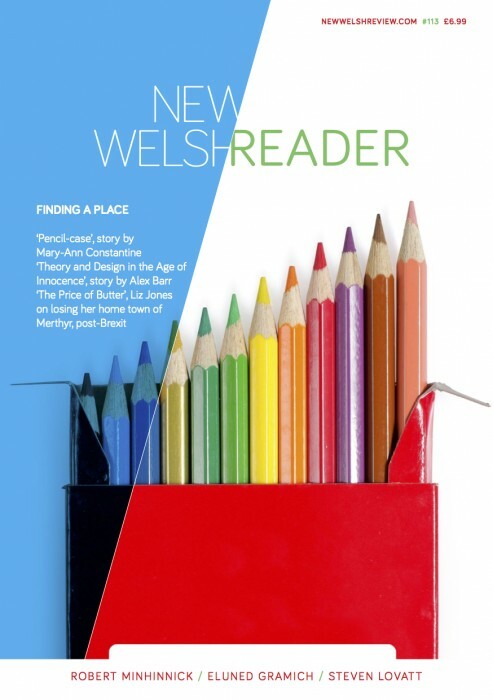 New Welsh Review has always been good at embracing change; it was, after all, established as the successor to previous incarnations Dock Leaves and The Anglo-Welsh Review, and has benefited from the individual imprint of several different editors over the last twenty years. Each editorship has coincided with distinct phases in Wales's literary culture: Robin Reeves's reign, for example, was particularly noteworthy for the happy marriage he facilitated between art and politics in the pages of the magazine during the run-up to devolution. My editorship came at a time when Wales's highly politicised literary culture was able to relax into itself a little following the establishment of a National Assembly for Wales. I aimed to reflect a vibrant, but increasingly complex, shifting literary scene, and to place the best work coming out of Wales on a platform that was better connected with mainstream publishing in the rest of the UK. In looking outwards, I wanted to bring readers and writers in. I also wanted to explore writing from Wales that crossed the boundaries between literature, visual art, performance, music and film. Many people have helped me along the way: if you look through a few of the back issues of the magazine from issue 57 to the present, at the names of colleagues and interns, contributors of articles, fiction, poetry, reviews and artwork, lists of editorial board members, and, last but not least, funders and sponsors, you'll see who I mean - it was they who made it possible for me to produce a vital, entertaining magazine of serious literary intent. As my editorship comes to an end and another epoch begins, it is very likely that the next phase of the magazine will, among other things, face a digital future head-on. Kathryn Gray - poet, critic, editor and sometime blogger - is perfectly positioned to bring a fresh impetus to New Welsh Review, forming dynamic connections between the past and present. I have instigated a great deal of change over the last six years, and have been surprised and touched at how loyal our core readership has been through those changes. It's time now for a new era, new directions and a new editorial perspective. I'm excited about what the future will bring, and wish Kathryn every success.